The first time I heard about this cast recording, I didn’t pay much attention. I had recordings of most of the songs and I thought this wouldn’t bring anything new to them. But I loved the CD cover and, miracle of miracles, the CD was on sale here in Lisbon. So, after a while, I decided to buy it and I was in for a big surprise. 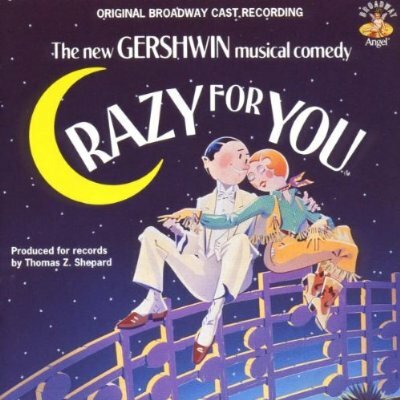 Using old songs from the Gershwin’s songbook, this new musical was responsible for bringing dance back to the musical and you can almost see the choreography in the album tracks, all you have to do is close your eyes. As a huge fan of dance, I surrendered completely to the charms of this cast recording. Believe me, this Broadway album is riveting and it’s a pleasure to hear so many great songs in just one show. With, among others, “I Got Rhythm”, “I Can’t Be Bothered Now”, “Someone to Watch Over Me”, “Shall We Dance”, “Embraceable You”, “Nice Work If You Can Get It”, “But Not for Me”, “Slap That Bass” and “They Can’t Take That Away from Me”, who can ask for anything more? I’m sure I can’t and it’s lamentable that no one writes songs like these nowadays. The cast is terrific! As the romantic couple, Harry Groener and Jodi Benson is a match made in heaven. Michele Pawk brings down the “house” with “Naughty Baby” and Bruce Adler, together with Groener, is hilarious with “What Causes That?”. The fabulous orchestrations by William D. Brohn are lively and, among others, turn “I Got Rhythm” into a fabulous contagious number. Cast albums don’t get much better than this and this one is among my top list. An unforgettable experience, that gives wings to our feet and put love in our hearts. Simply “S wonderful! 'S marvelous!”.